At one time, the NYC also controlled the Rutland and the Nickel Plate Road, but was forced to divest of these properties due to anti-trust concerns. 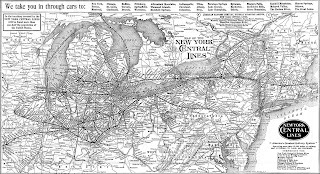 The rest of the subsidiaries and leased lines continued to be operated as the New York Central System, though “local” names persisted for many generations. A man in Detroit would tell you he worked for the Michigan Central, for instance. The flagship operation of the NYC was the luxurious first-class Twentieth Century Limited, operated on a crack 16-hour schedule between New York’s Grand Central Terminal and Chicago’s LaSalle Street Station. It was one of America’s premiere passenger services, and the subject of pop culture lore. The service was started in 1902, and came to an end in 1967 as a victim of corporate belt-tightening. As a result of shifting traffic patterns to trucks and Federally-funded interstate highways and a rapid decline in passenger traffic due to the advent of commercial jet travel, American railroads suffered from reduced revenue. More so in the industrialized northeast, where factories were closing and relocating to the south to take advantage of cheaper labor. On February 1, 1968, NYC merged with its chief competitor, the Pennsylvania Railroad to form the ill-fated Penn Central. A year later, the new company was forced to absorb the ailing New York, New Haven & Hartford. The cost savings from eliminating duplicate facilities and workers never happened, and Penn Central declared bankruptcy in 1970. A massive bailout came from the Federal government in 1976 in the form of Conrail, who took over the operation of the majority of the former PC system, along with five other bankrupt northeastern railroads. Today, much of the former NYC is operated by CSX Transportation and Norfolk Southern. Care to write about a specific division or subsidiary of the NYC? Contact the webmaster.